THE WATCHMEN features interviews with leading practitioners and conceptual artists from the watch industry. All episodes are minimum 25min duration unless stated otherwise. 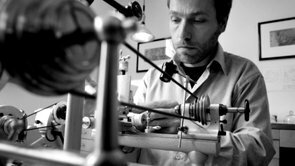 Antoine Preziuso is a one-of-a-kind Master Watchmaker in fine Swiss watch making today. With a recent return to the essence to authentic watch creation, these latest years are exactly the right time for the Antoine Preziuso style to become a classic.The fact that he assembled his first timepiece at the age of 7, finished at the top of his class at the Ecole d’Horlogerie of Geneva and went on to work for the most prestigious names in Geneva’s Haut de Gamme.."
With the launching of their first Invention the Double Tourbillon 30° in 2004, Robert Greubel and Stephen Forsey, French and English Inventor Watchmakers marvelled knowledgeable watch devotees with a new Tourbillon mechanism adapted specifically for the wristwatch. Only a handful of timepieces leave the atelier each month due to the sophisticated movement and exquisite finishing. The Inventor Watchmakers are committed to pure technical innovation and are dedicated to inventing new movements that have never existed in watchmaking history. Based around one very simple and fundamental ideal: to assemble dedicated Collectives of talented horological artisans, artists and professionals – all friends – to design and craft each year a radical and original horological masterpiece. 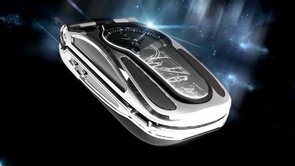 By nurturing teams of talented individuals, harnessing their passion and creativity and crediting each individual's essential role, MB&F uses their synergy to become much greater than the sum of its parts. 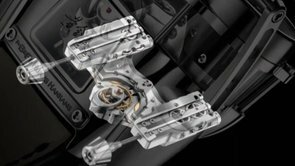 MB&F is above all a human adventure... a human adventure with just one goal: to create incredible horological machines." Having benefited from years working in Switzerland producing complicated watches and prototypes, and restoring antique horological pieces for the most exclusive watch houses, we have decided to start making watches under our own name. With McGonigle Watches, we aim to create unique timepieces of exceptional precision and quality and revitalise a tradition of watchmaking in Ireland. 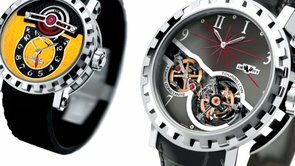 Bell Ross is a Swiss watch company headed by French designers Bruno Belamich and Carlos A. Rosillo. The brand was launched in 1992, and the first watches were designed by Belamich and Rosillo and made by a German watchmaker, Sinn. 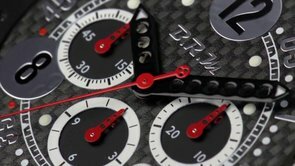 They comprised a group of designers and specialists of aircraft and space controls joined with a set project: to create watches perfectly suiting a professional use. Nowadays astronauts, pilots, divers or bomb disposal experts use Bell Ross watches as tools for their missions." 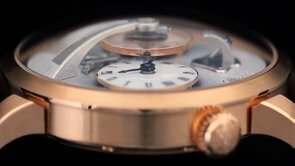 A direct descendant of Napoleon [Queen Elizabeth is his cousin]DeWitt has established itself in less than five years within the very selective circle of rare contemporary and innovative Haute Horlogerie Brands. The DeWitt spirit is driven by passion and creative boldness, perpetually oriented towards the unexplored mysteries of tomorrow's watchmaking art. Technological avant-garde and powerful designs blend in with an exclusive signature which sublimates the values of beauty, elitism and lasting quality. Cornelius & Cie uses vintage watch movements in proprietary cases of classic but innovative design. 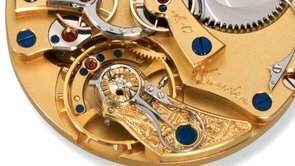 Every single part of the movements is embellished by hand, skeletonised, engraved by Kees Engelbarts, and rhodium or gold plated, offering customers extensive possibilities for very special personalised engravings of movements. The top of the barrel will be engraved by Kees with a text or a picture, turning each watch into an extremely personal one. The engraving can daily be seen through an opening in the dial." 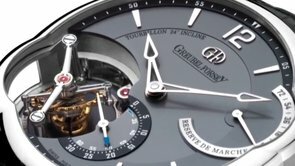 The name Grönefeld and the art of watchmaking have a family history spanning nearly one hundred years, originating in the small and ancient town of Oldenzaal located in The Netherlands. It is there, in a shop directly under the view of the ancient basilica church and its tower dating from 1240, that the grandfather of the present watchmakers, Johan Grönefeld, began his career as a watchmaker in 1912. Both Tim and Bart Grönefeld underwent extensive training in Switzerland, and within a relatively short span of time proved themselves adept world specialists in the production of the most coveted and exquisite horological complications of all: the tourbillon and the minute repeater wristwatch. 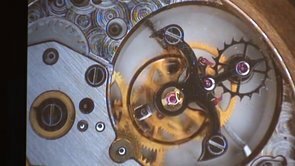 After 8 years with Renaud & Papi, where Bart was workshop manager and responsible for training, Tim in charge of escapements and regulating and assembling tourbillons, they returned to the Netherlands in 1998 to set up their own service workshop. 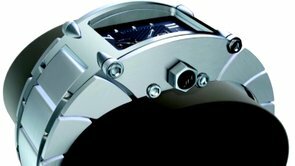 In 2008 Tim and Bart presented the first watch bearing their own name, the GTM-06 Tourbillon Minute Repeater." Steve Clerici's passion to be a "Rebel with a cause". To produce very individual watches. Legacy Machine N°1's transcendental in-house movement bears testimony to the enormous talent of its creators. Jean-François Mojon and his team at Chronode (Best Watchmaker Prize at the 2010 Grand Prix d’Horlogerie de Genève). Guvinda Srivastava Anadi embodies passion and sensuality - a true luxury sports car. A Thoroughbred from Italy. As a manufacturer Soleil believes that a car should not only be a mode of transportation but a representation of a person’s cultural identity. The Anadi represents years of technology, experience and limitless potential." A student and colleague of Breguet, Oudin was a distinctive and often overlooked protege of the great master." Life washed me on land on September 26th, 1964, and confronted me with a most important question 16 years later: ‚What are you going to do?'. My answer was: ‚watchmaker'. Fate smiled and answered: ‚Ok, you're going to be toolmaker!'. Back then I could not understand this initial irritation, but meanwhile I'm very happy with this stroke of fate. Because of this decision I now know the promise of university studies, worked independently and on my own responsibility as a draughtsman, developed machines and - along the way - could indulge to my passion: watchmaking! By the time his atelier was founded, this predisposition á complication had already made him well known in collector's circles, with complicated antique watches by the likes of A. L Breguet, Thomas Earnshaw, Girard Perregaux, Adolf Lange, John Arnold, Patek Philippe, Urban Jurgensen, LeRoy, Thomas Mudge and Thomas Tompion arriving to Twann for restoration. 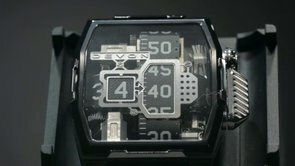 The purpose of creating DEVON was to enable a customer to find “any product in any category to make their heart beat faster.” This goal translates into a uniquely engineered store that offers everything from minimalistic motorcycles complimented by intricate men’s timepieces, to futuristic TRON-inspired jewelry that can be paired with premium denim that hugs a woman’s curves like nothing else. Frank Jutzi is an independentFrank Jutzi table clock with tourbillon watchmaker, the member of AHCI, the creator of table clock and wristwatches. Frank is one of the watchmakers who prefer watches with tourbillon. All his models whether it is table clock or wristwatches equipped with open tourbillon which makes a perfect view." 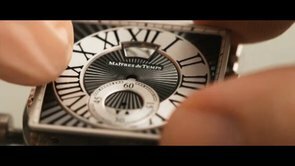 Graduated from the watchmaking school of Paris in 1981, Vianney Halter spent the first ten years of his professional life with the restoration of old clocks, pocket- and wristwatches. This enabled him to acquire a broad knowledge of horology. Independent since 1994, he imagined and realized various timepieces for famous brands. Strong of this background, he realizes his own watch in 1998, the Antiqua. This perpetual calendar has been presented at the Basle Fair in 1998 at the AHCI boot, which he is member of since 2000. Eva Leube had a vision of a timepiece curving elegantly around her wrist like a piece of jewellery, bearing a beautiful movement arcing gracefully with the contours of its case. Taking four long years to develop and create, 'Ari' is the hard-won realisation of Eva’s dream; a watch consummately presenting the inordinately complex as simple and uncluttered… and stunningly beautiful. BLACK SAND Watches [Swiss] Alain Mouawad"
A group of passionate watch engineers from "Neuchatel" [the anagram of Hautlence!]. Founded in 1865 by Georges Favre-Jacot, ZENITH became one of the most mythical and prestigious Swiss watch manufactures. Born in 1969, the El Primero movement remains today the fastest automatic chronograph and the most precise in the world. Drawing inspiration from the legacy of its young and brilliant founder, ZENITH forges a unique style, classical and yet innovative, the link between tradition and modernity. Aaron Becsei was born in Budapest and is the 3rd generation of a watchmaker dynasty. In order to develop himself as a watchmaker and to get the necessary practical experiences he started to work on watch repairs with his father." 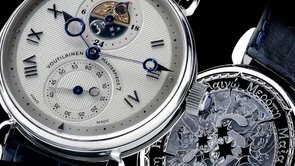 Urban Jürgensen & Sønner Copenhagen continues to produce complicated watches in classical styles as individual examples or in very small series. A group of eight highly qualified watchmakers, working in four different workshops, produce exclusively mechanical timekeepers. The inspiration and knowledge gleaned from working in restoration of historic treasures fired his desire to work and further his knowledge of watchmaking to an even higher level. Returning to Switzerland in 1996 to work on modern watches he specialised in complications both building them and in their development. In 2000, after 15 years of study he embarked on his personal dream; an independent workshop in which he could design and build his own watches. 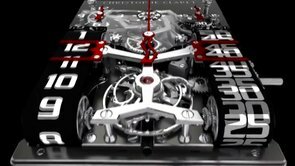 A new concept watch has been built which is the first ever to combine both mechanical and liquid engineering. 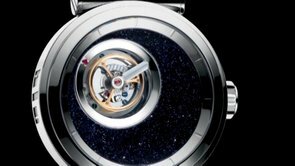 The new concept watch has been created by master watch maker Vincent Perriard & Co and is called the HYT H1 and comes with the hefty price tag of $45,000, with a titanium case. 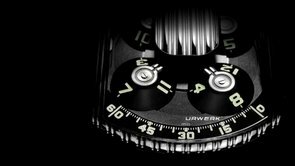 The H1 uses liquid-driven pistons as well as gears to tell the time. The Pistons in the movement move the bellows, which then push green fluorescein liquid around the dial to indicate the time. 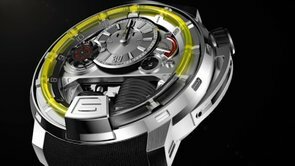 Unveiled at the Basel World 2012 show, the timepiece is known to use advanced fluid mechanic sciences to display time, and carry on with its daily functions with near perfect balancing. Grieb & Benzinger You can feel the time spent to create a handcrafted masterpiece. It is a sensual experience of history and time. You can hear the stories that our timepieces tell. They are written especially for you. You can see the harmony of composition that underlies a particular timepiece. It is a feast for the eye. GRIEB & BENZINGER PLATINUM. Handcrafted masterpieces reinterpreted to perfection. When making his wristwatches, Christiaan van der Klaauw drew his inspiration from astronomy, just like he did with his clocks. His first wristwatch was the 'Satellite du Monde'. His recent "Planetarium" was inspired by astronomers like Christiaan Huygens and Eise Eisinga." Svend Andersen, worked in several famous watch shops in the Valaisian Alps, Lucerne and Geneva until he got engaged by Patek Philippe in 1969. 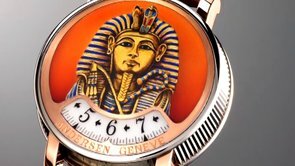 In 1979 he started as independent creator and ever since he continues to surprise the connoisseurs and collectors world-wide with his amazing watch creations of technical and artistic perfection. The Blu-Planet, one of the first orbiting timepiece collection, has found its prestigious expression. This original platinum/white-gold jewellery watch was crafted by Bernhard Lederer, the horological creator behind Blu, the Swiss watchbrand that explores new ways of expressing time with advanced mechanical solutions. Creator of Antiquorum , the world’s leading watch auctioneer, which has unlike any other auction house in the world, carved a niche for itself by promoting its passion for watch and clock collecting. Established in 1967, Sinclair Harding honours the historical tradition of fine English clockmaking. The exquisite detail of each clock is testament to this skill and dedication, with every delicate stage of production carried out in the Yorkshire based workshop. Every clock Sinclair Harding makes is lovingly crafted to suit your individual requirements and your involvement is encouraged at all stages during production of what will become a treasured heirloom. Clients are welcome to visit the workshop to appreciate first hand the trademark skill and dedication of Robert Bray and his fellow craftsmen. Sporting a BRM watch for the first time is like admiring a line of cars with extraordinary engineering on the starting line of a mythical race. The superior mechanical performance unites with human desire to surpass ordinary expectations : to push the outer limits of human indulgence ! Wearing one of these superb time pieces makes a personal statement about life. Marco Lang was born in 1971 and grew up in the atmosphere and challenge of the Dresden watch making tradition. As a fifth - generation watchmaker, he could already learn by observing his father Rolf Lang who worked as head restorer in the Mathematical / Physical Cabinet (Mathematisch Physikalischer Salon), one of the world-famous collections of watches and precision mechanical instruments. Established in 1955 in La Chaux-de-Fonds, Switzerland, CORUM has always taken pride in being a refreshingly different and forward-thinking Swiss timepiece manufacturer. Renowned for innovation and exquisite craftsmanship, CORUM's offerings of unique and unusual timepieces convey excitement and passion throughout an impressively varied collection. "Horology is in my blood. I am the son and the grandson of watchmakers. The first musical concert I remember was played by the more than 50 clocks tick-tocking in his atelier in our home. I was a watchmaker by birth and am now a watchmaker by passion." Protege of George Daniel, Roger Smith reinterprets the past, combining them with modern horological developments such as the Daniels co-axial escapement in order to create exclusive and distinctly English wristwatches for the connoisseurs of today. “My watches are a hundred years behind the times”. A certain feeling of unrest keeps me going not only making watches but continually improving them. This means nothing more than bringing them up to the same standards of technical perfection and precision, the same aesthetic clarity as 100 years ago. This fascination of watchmaking you will find in all my watches. This concept, a trinity of three talented artists Jorg Hysek, Valérie Ursenbacher and Fabrice Gonet working together in total harmony for many years, evolves continuously and never ceases to strive for new heights of excellence. The subtle bond between fine watchmaking and high tech gives a new direction to 21st century watches, marvels of design and resolutely oriented towards the future. The Big Bang models of grandiose proportions diameter illustrate the four elements of Hublot’s new fusion concept: traditional Swiss watchmaking, visionary artistic ideas, the blending of materials and the latest technological advances. 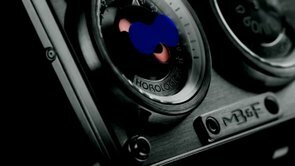 The new model also demonstrates the company’s legendary design skills. The angles have been sharpened slightly to accentuate the multilayered complexity of the enlarged case. 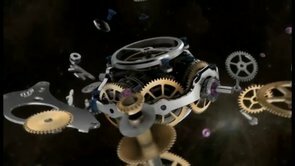 There are watchmakers today who are craftsmen, but do not innovate, and there are those who innovate, but only in theory and with computers, but leave the actual crafting for others to do, and then there are those who innovate and craft, however, it is not beautiful: it is strictly about function - not about art. This, in fact, is quite normal. We don't usually find, nor expect, one watchmaker to have all of these qualities.